Tennis is a unique sport that involves intense physical activity for a prolonged period of time. Nobody knows how long one’s match will last until the final point is won. Thus, it is vital for every tennis player to have the aerobic capacity to have the proper endurance and tolerance. Nutrition plays a very important role and should be part of every athlete’s preparation. It’s no secret that most of the professional tennis players on the ATP and WTA Tours have their nutritionists working with them as a part of their team—evaluating, calculating and personalizing a meal plan is a major part of their job. A diet, complete in specific vitamins and minerals, can prevent muscle cramping. Here are some nutrients that can prevent muscle cramping. If properly incorporated in proper amounts into one’s diet, your chances of being cramp-free during a long match can greatly improve. ►​Sodium: Sodium is one of the main positively-charged mineral ions or electrolytes in body fluid. The body needs sodium to help maintain normal body-fluid balance and blood pressure, and in conjunction with several other electrolytes, it is critical for nerve impulse generation and muscle contraction. An athlete should not consume a low sodium diet and should always drink regular Gatorade to prevent sodium deficiency. ►Potassium: Potassium is the major electrolyte found inside all body cells, including muscle and nerve cells. It works in close association with sodium and chloride in the generation of electrical impulses in the nerves and the muscles, including the heart. Potassium is found in most foods, but is especially abundant in fresh vegetables, potatoes, certain fruits (melons, bananas, berries and citrus fruits), milk and meat. ►Calcium: Calcium found in the body is found in the skeleton where it gives strength to bone. Calcium is involved in muscle contractions, including that of the heart, skeletal muscles, and smooth muscle found in blood vessels and intestines, as well as the generation of nerve impulses. Blood calcium is tightly controlled and regulated by several hormones, including parathyroid hormone and Vitamin D. Adding an extra glass of milk and yogurt for breakfast will assist in helping prevent cramping as well. 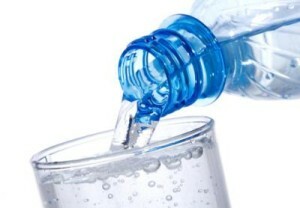 ►Fluids: Water is the number one ingredient every cell and tissue of the body needs in order to survive. The fluids that circulate throughout your body dissolve minerals known as electrolytes. Electrolytes help properly regulate the fluid levels inside and between cells, and are vital for the proper functioning of your cells, tissues and muscles. It is very important for a tennis player to know how much to drink before, during and after the match. Dehydration can force your heart to work harder, your core body temperature rises, and as a result, your performance will fall dramatically. Over-hydration is the other extreme, and it can decrease your athletic performance. Too much fluid will cause the electrolyte concentration in the body to become overly diluted, thus compromising athletic performance. Finding your fluid/electrolyte balance is key to sustaining long and multiple matches. Your hydration zone is the perfect level at which you perform your best. A registered dietitian, specializing in sports nutrition, can help you to calculate the exact amount and type of fluid needed for optimum athletic performance. Personal pre- and post-tournament meal plan suggestions will help you to play your match better. Visit www.irinalehat.com for classes, workshops and private consultations. Call (917) 769-8031 for an appointment, and mention my article in Long Island Tennis Magazine to receive 20 percent off.